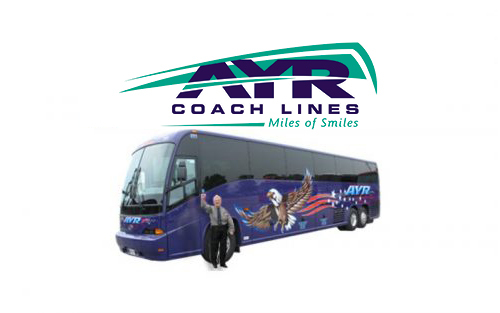 Enjoy Miles of Smiles when traveling with Ayr Coach Lines! Providing charter services since 1965, Ayr Coach Lines is a family owned company with its second generation participating in every aspect of the organization. Whether arranging a tour, sporting event or corporate function, their knowledgeable support staff will be happy to guide you through the process of identifying your needs and creating the best solution with you. Ayr Coach Lines can help prepare group travel itineraries, charter reservations and provide other special accommodations to make every trip enjoyable. Coming from Europe to see North America? They can help to make your trip memorable and truly enjoyable. Choose from a number of different coaches, designed to meet the needs of large and small group travel. They are a full service charter company and have a diverse fleet to accommodate different size groups, requirements and budgets. Their motor coaches incorporate safety and comfort, while accommodating groups from 47 to 54. Extras such as reclining seats, foot rests, air conditioning, stereo and video systems, as well as washrooms and large luggage compartments make travel comfortable and relaxing. Their new activity coaches offer more economical travel, and are ideal for teams, shuttle services, weddings, and corporate functions. For smaller groups traveling shorter distances, their mini coaches are the perfect travel solution. Ayr Coach Lines provides a first class driver training program with some of the best safety training in the industry. Most of their business is repeat business, and referrals from passengers. Taking the time to listen to their customers’ needs, Ayr Coach Lines continues to look for ways to make travel even more enjoyable and memorable! The Region of Waterloo International Airport (YKF) is a full service modern facility that supports commercial, corporate and general aviation. Flights are available from Waterloo Region to Toronto, Calgary, Orlando, Florida and Punta Cana, Dominican Republic.